Have you participated in the Power Poppy Peep of the Week Challenge? They have these new amazing Christmas stamps and it's so easy to join the fun!!! I love this gorgeous poinsettia set and pretty sayings to compliment them. This is the screen divider card that Split Coast has a video on. I used a Martha Stewart punch and Sissex punch to create the screen divider. I just edged the images and card in gold pen to finish the card. I saw this tutorial on SCS too...so classy! 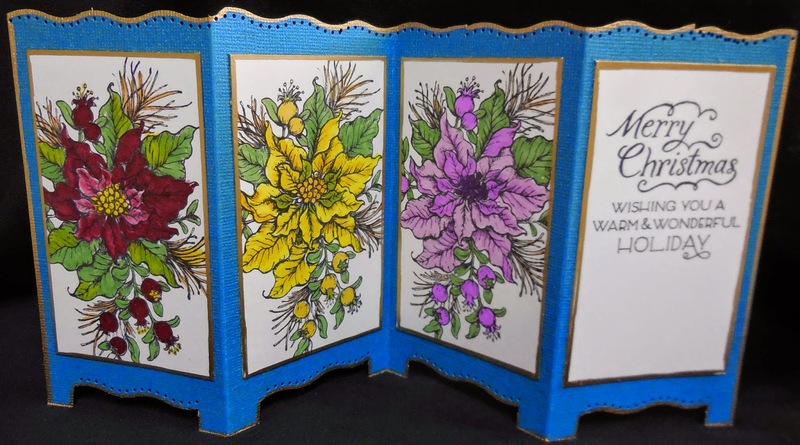 Beautiful work with this poinsettias Karen! Thanks for playing along with us at Power Poppy!